The Prices’ Trinkit, a jewelry enameling kit, turned them into big-time hobby makers. BILL and Barbara Price were in a rut. Both of them had been department store buyers for three years. Now, in the spring of 1953, their jobs were beginning to pall. They wanted something a little more exciting to do. Their bank account amounted to $3,500. By investing the money in a business, Bill and Barbara could buy all the excitement they wanted. But instead, they gambled their savings on a trip to Europe, in the hope that the trip would produce a money-making idea. And it did—an idea that raised this 28-year-old couple into the ranks of the nation’s most successful hobby-kit manufacturers. Their product, developed with the aid of such items as old soft drink bottles, automobile taillight lenses, and a converted food mixer, is sold throughout the country by some 500 retail outlets, including Macy’s, Gimbel’s, and Marshall Field & Co.
Bill and Barbara are the proud manufacturers of Trinkit, a jewelry enameling kit. The kit consists of an electric kiln operating on 110-volt current; copper jewelry blanks; findings (attachments); six tubes of colored enamel; spatula; oil; oil brush; asbestos board; solder; and sandpaper. To make jewelry with Trinkit you dust one of the blanks with enamel, then place it on the spatula, fire it in the kiln. The enameled blank then cools on the asbestos board. Oil is used to add a design in a second color; first you paint the design on the piece in oil, then you dust on the enamel of the second color and fire it. To solder with Trinkit, you sandpaper the back of the enameled blank, then put it on the kiln lid (cold at this point). You place the attachment on the back of the blank in the position it will occupy when the jewelry is completed. A bit of solder is placed alongside the attachment. Heat forces the solder to flow into the joint. After this connection has hardened, further sanding and polishing completes the jewelry. The whole job usually takes less than an hour. Additional supplies can be purchased at Trinkit retail outlets, or you can make your own blanks from sheets or strips of copper stock obtained from jewelry supply houses. Bill didn’t think about enameled jewelry until several weeks after they had arrived in Europe. One day in Florence, Italy, they walked into a small jewelry shop. Bill noticed some especially at- tractive enameled jewelry—earrings, pins, and pendants. He looked closer when he saw the price; none of the items was more than $1.25, yet they seemed worth 5 or 10 times that much. Bill picked up an earring and tried to figure out how it had been made. He knew, from helping Barbara glaze pottery, that enamel was basically colored glass powder. He reasoned that it had been applied to the metal and then heated. If such a simple process could produce such beautiful work, he told himself, why wouldn’t it be possible to make a kit that an amateur could use? He knew that, regardless of any other equipment, the kit world need an electric kiln, so he began designing one, hoping that the other problems would work themselves out later. “Trinkit” was Barbara’s idea. She dreamed it up one morning a few weeks after they had left Florence. Up until this time, she had had only a few vague hints about what was going on in Bill’s mind. But that morning he started pacing around the room and suddenly told her his basic ideas for an enameling kit. Five minutes later, excited as he was, she asked, “Why don’t we call it Trinkit?” • The Prices had a catchy name for their kit, but no simple jewelry-making technique that could be put in a box and sold at a price that would fit the wallet of the average “do-it-yourself” enthusiast. Bill rummaged through libraries and when they reached England on their way home, he found a clue to what he was after. It was an account of jewelry-making during the Middle Ages. “I figured that if jewelry could be enameled with the primitive tools available then, much of the complex operation I had been reading about could be eliminated, one way or another, without appreciably reducing the quality of the product,” Bill explained. Back in Bloomington, they began working out the shortcuts. 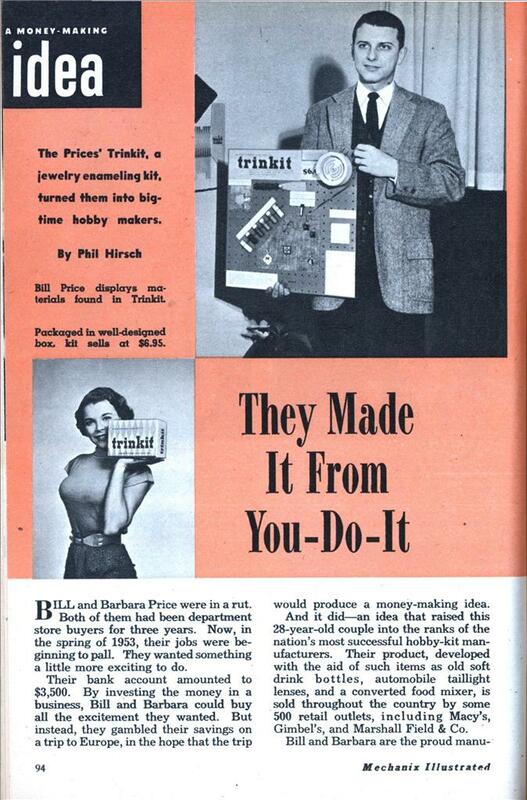 Bill and Barbara knew Trinkit’s market was among individuals with comparatively little time and even less specialized jewelry-making experience. These people would be interested in making jewelry if the details weren’t too complicated, the investment wasn’t too large, and most important, if the quality of the product was comparable to the jewelry sold in all but the most high-prices stores. The kit was planned to sell for under $10. (It sells for $6.95 today.) The couple was in an unenviable position that September. For capital, they had $700 in cash and Bill’s life insurance policy, which could be converted into a loan (it was a few months later). They had an idea, but it was a long way from being ready to make money. Meanwhile, they had to keep expenses down, so cash would be available for getting into production once the design problem was out of the way. Bill decided to start out with the crudest and most basic materials. So he went out and rounded up bits of colored glass—empty soft drink bottles, beer bottles, and old bluing bottles. These supplied all the colors except red. Finally, in a garage, he found broken red glass from several automobile taillights. He took all this junk home and ground it into powder with a mortar and pestle, following the instructions in the centuries-old description of jewelry-making he had found in England. For a kiln, he used the kitchen stove at first. Later, he built his own kiln, substantially the same one that is in the present Trinkit set, out of firebrick and asbestos. He cut grooves in the firebrick for the electric heating element and wound the coil on a homemade rig made of an old food mixer and a strip of rubber. Bill made about 20 coils on this contraption before producing one that achieved a temperature of 1500 degrees F., hot enough to solder with but not so hot that it burned the jewelry enamel. The mixer also supplied heating coils for the first Trinkit sets, about 5,000 of them, until Bill could afford to hire someone to wind them on a contract basis. Late in March, 1954, Bill went to Chicago with several homemade Trinkit sets in his suitcase. His only advance preparation was to collect a list of stores with hobby departments. When he arrived, he started at the top of the list and worked his way down. * By that afternoon, the list was exhausted, except for one store, Mandel Brothers. He had demonstrated Trinkit to a few buyers, all of whom had been uninterested. Several others had even refused to let him in the door. Bill decided to skip Mandel’s. He climbed wearily into his car and headed toward U.S. Route 66, which would take him back to Bloomington. But in the rain, fog, and traffic around Union Station, he made a wrong turn, and found himself back in the Loop again. It was probably the luckiest mistake of his life. For he decided to park and give Trinkit one more try. Bill received his first order for 36 sets that afternoon at Mandel’s, and tran- sacted an even more important piece of business the same day. Finally, after Bill had obtained his order, he learned that the stranger, Pete Crededio, was a manufacturer’s representative. Crededio was impressed with Trinkit, so impressed that he wanted Bill to let his firm, Vernon, Bernard & Co., distribute it nationally. Bill agreed to sign a contract with the firm that evening. Business boomed after that. Mandel’s initial order for 36 kits was followed within the next few weeks by three more for 72, 144, and 288 kits. And within a short time, Vernon, Bernard & Co. salesmen were sending in requests for Trinkit from stores all over the country. I remember using my mom’s Trinkit set as a kid. She’d had it since the 50s, and as far as I know, it still works to this day. Barbara had a very nice “set”. In the text is says that Bill picked up an earring ……..and now he wears ’em. My, how times have changed. @Eric, I think an ad for her “form” was on this very blog a few months ago. these kits might sell well today in the US as we’re settling in and becoming used to being a third world country like North Korea and Mali. People can have their own little business and sell these trinkets to neighbors and such. Don: Yeah, North Korea. Riiiiiiiiiight.